But scientists—who want to harness the potential of cells as living computers that can respond to disease, efficiently produce biofuels or develop plant-based chemicals—don't want to wait for evolution to craft their desired cellular system. Each cellular NOR gate consists of a gene with three programmable stretches of DNA—two to act as inputs, and one to be the output. The authors then took advantage of a relatively new technology known as CRISPR-Cas9 to target those specific DNA sequences inside a cell. 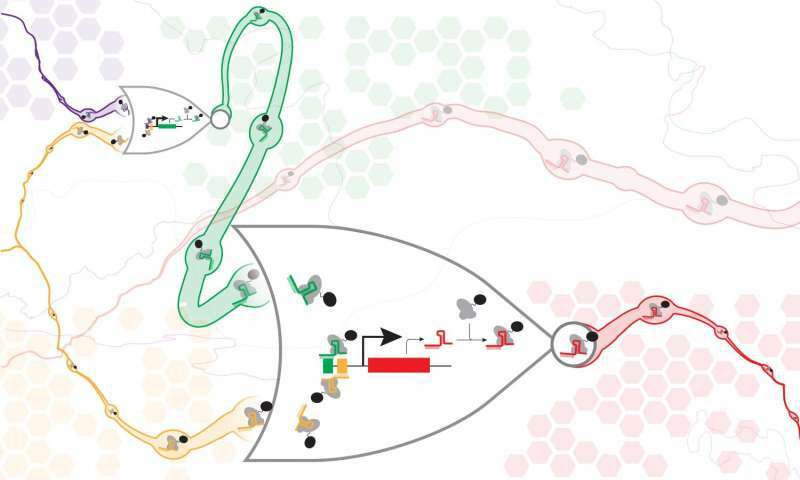 The Cas9 protein acts like a molecular gatekeeper in the circuit, sitting on the DNA and determining if a particular gate will be active or not. What sets the study apart from previous work, researchers said, is the scale and complexity of the circuits successfully assembled—which included up to seven NOR gates assembled in series or parallel.